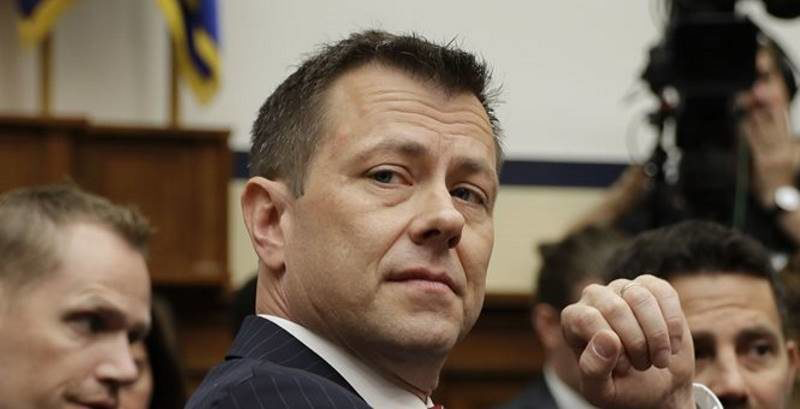 Peter Strzok (pronounced “strock”) was the lead FBI investigator in the Mueller probe into both Hillary Clinton’s emails and the Trump-Russia collusion, 2015 -2017. Last month I wrote about The Inspector General’s Report, June 14, 2018 and the critical role Strzok played in both of these high profile investigations. He appeared before Congressional hearings June 27, 2018 (behind-closed-doors) and July 12, 2018 (televised). Both sessions endured for over 10 hours, but the latter received particular notoriety. This story is not over yet. Authenticated birth data for Strzok became available in late July 2018 and is now listed at Wikipedia in Footnote #1. Peter Strzok II was born March 7, 1970, 5:30 am EST, Kincheloe Air Force Base, Michigan. This was 7 hours 12 min. prior to an exact Solar eclipse at 12:42 pm EST at 23:17 Aquarius (sidereal/Lahiri), and within one day of the exact Jupiter-Saturn opposition on March 8, 2018 at 12:05 Libra-Aries. Both of these factors alone show an eventful life, further modified by how the birth chart is configured. This birth chart shows a few changes from the one given last month, notably the Ascendant of the birth chart and the Navamsha chart. The 5:30 am birth time shows natal Moon a few degrees further behind the Sun and closer to Rahu, while all other planets remain in the same zodiacal signs. The Ascendant at 10:37 Capricorn (sidereal/Lahiri) is within 01’ orb to the Total lunar eclipse July 27, 2018 at 10:38 Capricorn, and accounts for greater intensity in his life in the months surrounding the eclipse, amplified also by transiting Mars and Ketu closely straddling the eclipse Moon and tr. Mars-Ketu midpoint at 10:49 Capricorn. The fiery nature of Mars-Ketu reflects the fiery controversy that currently surrounds Peter Strzok. For a brief review of how to read a South Indian chart, please click here. The Ascendant is Capricorn and in Shravana nakshatra, ruled by the Moon. Since natal Moon closely conjoins Rahu, this destiny is already showing some issues around extreme emotional volatility and unpredictability, even if in a fixed sign (Aquarius). All the physical planets are below the horizon, except for Jupiter, which is lord of the 12th house of hidden matters and of loss. Four planets are concentrated in the 2nd house (Mercury, Rahu, Moon, and Sun in Aquarius), giving a lot of emphasis and intensity to the affairs of the 2nd house: speech, food intake, and financial income. Such a loaded house, even with a benefic Jupiter aspect, shows a propensity for excess in this area of life. Though Jupiter brings abundance, it has the potential for creating excess, especially since it is in a mutual exchange with natal Venus, and tr. Jupiter returned to Libra in mid-Sept. 2017 for 13 months, bringing the possibility of excess into greater focus. The number of planets in AIR signs (5) facilitates ease of communication and absorbing a lot of information, but Jupiter’s influence brings exaggeration and Mars brings acceleration of all the above. All 4 planets in the 2nd house are on the eclipse axis (Rahu-Ketu). Further, 6 out of all 9 planets are in nakshatras owned by either Rahu or Ketu. Natal Moon-Rahu in particular is a more volatile and emotional combination, as Rahu eclipses the Moon. And since the 2nd house is below the horizon, the actions of 2nd house planets are less apparent to others most of the time – until the Ascendant or the Moon is highlighted in some way, as with the July 27, 2018 Total lunar eclipse. The Ascendant in Moon-ruled Shravana nakshatra already points to the importance of the Moon and the affairs over which the Moon rules in general; also to the Moon’s placement in the chart and the specific house it rules. Moon governs the mind, happiness of the heart, emotions, capacity of feeling, memory, mother, women, and the public. For a Capricorn Ascendant, House 7 (Cancer) is the house of marriage and business partners. Strzok was married at age 24 (1994) and has 3 children. His wife, Melissa Hodgman (b. Feb. 12, 1968), has a powerful position at the SEC (Securities and Exchange Commission), where she has been employed as an attorney since 2008. Promoted in 2012 to Associate Director of their Enforcement Division, she was promoted again Oct. 14, 2016 by Pres. Barack Obama to head the SEC investigation into the Clinton Foundation, a probe that has been largely blocked for over 21 months under her direction. We will discuss more about Strzok’s wife and business partners shortly, as they both play a major role in the events of his life from 2015 to 2018. Strzok first came into notoriety in Dec. 2017 when some of his voluminous text messages to FBI lawyer Lisa Page became public. Page was assigned to work jointly with Strzok on the Clinton and Trump investigations, and they were involved in an extramarital affair for several years. Page is married and has 2 children. All but one of the physical planets is below the horizon in Strzok’s chart. This can indicate a more introverted person or someone who lives and works behind-the-scenes. Jupiter is the only planet above the horizon, and as ruler of the classically hidden 12th house, it shows either a career loss, or a career involving 12th house (hidden or foreign affairs) matters – as fits the case for someone who deals with clandestine activities as part of their work; also, their employment position itself may be clandestine. As an experienced FBI agent, Strzok is reported to have worked on some of the “most secretive investigations in recent years involving Russian and Chinese espionage.” (The New York Times, April 22, 2017). After 4 years in the Army, Strzok is said to have entered the FBI in 1996, initially as an intelligence analyst, then later as an agent. On May 8, 1996, tr. Uranus (planet of abrupt changes) turned Stationary Retrograde on Strzok’s Ascendant, a point of major self-identity. The SR degree was 10:47 Capricorn, or 10’ orb from his Ascendant. Also, through much of 1996, tr. Pluto was transiting close to Strzok’s Midheaven at 6:30 Scorpio. The Midheaven identifies one’s career and social status (as does the 10th house cusp). Tr. Pluto’s close contact to this point can bring a very profound structural shift in career orientation. And Pluto itself is highly symbolic of the CIA, FBI, and the Deep State, i.e. the workings of the government that are considered unknown and unaccountable to the public or to Congress. As with many of the intelligence agencies, they operate in secret, holding the weapon of “ongoing investigations” or “classified information” as their tool to block more thorough scrutiny by Congress or the media. Just as with Pluto, they do not wish to be identified, and this perpetuates unaccountability. In a photo taken Sept. 9, 1996 at a ceremony where James Brady is receiving the Presidential Medal of Freedom from President Bill Clinton, Strzok is seen standing at the back of the stage. He is there allegedly as a member of the Pres. Clinton’s Secret Service/CIA Task force. Some regard this photo as some of the evidence that Peter Strzok is indeed both FBI and CIA. Further evidence may come astrologically from natal Neptune (7:26 Scorpio) close to his 10th house cusp (10:37 Scorpio). Thus, Strzok’s career may have some nebulous components to it and some parts of it that may be obfuscated. Counterintelligence work is well known to involve deception. With CIA’s “wilderness of mirrors,” for example, many different stories are planted with the intended result of increasing confusion. Neptune is known for its ability to hide in plain sight and for its many levels of deception, often created out of a sense of obligation or fantasy, or at times both. With the 12th lord in the 10th house, this matter is compounded astrologically. So when Strzok was asked at the Congressional hearing if his extensive anti-Trump text messages to Page (while leading the FBI’s major investigation of Trump) showed political bias, he said it was only “the appearance of bias” – and that that was the only reason the FBI had a problem with it. The leftist Establishment media and social media were very quick to agree with this rationale. Strzok’s career has prospered for many years, and would do so especially during the transits of Saturn to his 9th, 10th and 11th houses (Sept. 10, 2009 to Oct. 26, 2017). He was promoted to FBI Section Chief in July 2015. But there are astrological indications that his career and public status would suffer from controversy, excess, setbacks, and losses at various times. The prosperity comes from classic benefic Jupiter in the 10th house aspecting the 2nd house of financial income; also, from 10th house lord Venus exalted in the 3rd house of communications and short distance travel. His work as an intelligence analyst clearly benefits from this. Jupiter and Venus form a Parivartana yoga, with Jupiter in Libra (owned by Venus) and Venus in Pisces (owned by Jupiter). Any Jupiter-Venus mutual contact can bring abundance and also excess. His marriage in 1994 and the start of his FBI (and possibly CIA) employment in 1996 both occurred in Saturn-Venus period. Though we do not yet have a confirmed date of marriage, ideally the marriage occurred in the more auspicious Venus sub-period, starting July 29, 1994. We note also that Navamsha Venus and Saturn are together in the 4th house aspecting Jupiter in the Navamsha 10th house. This would signal a foundational period for building both family and career. Career losses can come from 12th lord in the 10th house, as mentioned, and setbacks and controversies to career come because 10th lord Venus is situated in the 6th house (of conflict) from the 10th house. That this controversy would come through Strzok’s communications, derives from 3rd lord Jupiter in the 8th house (of loss and accidents) from the 3rd house. All this combines to bring excess of communications as a major factor for any career problems, especially when compounded with Venus-Jupiter in mutual contact (Parivartana yoga), and natal Jupiter in Libra aspecting 4 planets in the 2nd house of speech. Speech is made further volatile by Rahu closely contacting both Mercury and Moon, planets of speech and mental, emotional equilibrium, respectively. When tr. Jupiter returned to Libra (Sept. 17, 2017 to Oct. 12, 2018), this was actually problematic for Strzok. Though often we like tr. Jupiter in the 10th house as a classic benefic, it depends on how Jupiter is configured in the chart as a whole. This Jupiter has other associations, as mentioned, that make it challenging for career matters. Note that Strzok was removed from his position as Lead investigator on the Trump-Russia collusion in Aug. 2017, one month before tr. Jupiter entered Libra. But it was done so quietly that no one started to ask more about it until Dec. 2017, when the FBI was required to answer questions on the matter. By this time, tr. Saturn had entered Sagittarius (Oct. 26, 2017), and this too was far more problematic for Strzok. Transiting Saturn in Scorpio was more protective for his career vis-à-vis its position from the Capricorn Ascendant (11th house) and from the Sun, Moon, and Dasha lord Mercury in Aquarius (10th house). Capricorn Ascendant is ruled by Saturn, and the four planets in Aquarius are also ruled by Saturn. Capricorn Ascendant and/or Saturn in the Ascendant gives a sense of duty and obligation. In this case, Saturn closely aspects the Ascendant, within 1°21’orb, so the Saturn influence is strong on many levels. The person is a very hard worker, even more so during Saturn major or minor periods. Ascendant lord Saturn is in Aries in the 4th house, contacting a strong Mars also in Aries and opposite retrograde Jupiter in Libra. Natal Saturn is Neecha Bhanga Raja yoga, i.e. in its sign of debilitation in Aries, but receiving correction by its contact with Mars in its own sign of Aries. What this indicates, especially for the Ascendant lord, is that the person gradually gains strength and confidence in life, after a period of initial weakness and setbacks. This often enables the person to succeed at higher and higher levels over time. Since Mars is a force for education and advancement in his life, these areas prosper in Saturn Dasha, after some initial setbacks due to Saturn’s debilitation in Aries (Neecha Bhanga Raja yoga). Strzok entered the 19-year Saturn Dasha Oct. 7, 1987, exactly coinciding with the start of his first year at Georgetown University. Prior to that, during the 16-year Jupiter Dasha, Strzok spent many years abroad, first in Tehran (the American School in Tehran), and later in Saudi Arabia (the American School in Saudia Arabia) before returning to the U.S. in the mid-1980s. He completed his secondary education in June 1987 at St. John’s Preparatory School in Collegeville, Minnesota. Dasha lord Jupiter is the 12th lord (of foreign residence), situated in the 10th house in both the birth and Navamsha charts, and is lord of the 12th house in both charts. Moon-Rahu is also in the 12th house in the Navamsha, giving him a greater sense of comfort with foreigners or exotic or outcaste people (Rahu) and in 12th house settings (which include foreign residence, or more private, behind-the-scenes venues). The near exact Jupiter-Saturn opposition at birth gives entrepreneurial abilities. The 19-year Saturn Dasha encompassed the period during which Strzok received his B.A. degree from Georgetown University (1991), met and married his wife (1994), probably in Saturn-Venus period, served in the U.S. Army, and entered the FBI (and possibly the CIA) in 1996. Venus sub-period would have been fruitful for love and career matters, with Venus exalted in Pisces and lord of the 5th and 10th houses. Saturn-Venus ran from July 29, 1994 to Sept. 28, 1997. His college graduation was 8 or 9 months into Saturn-Mercury period, and Navamsha Mercury is well placed in the 9th house of higher education. (Both 4th & 9th houses cover this arena of life.) So we see how the 19-year Saturn Dasha was well-timed to provide Strzok’s major educational, career, and family building blocks. Saturn gains strength through its contact to Mars, and also becomes more of a warrior. Together Mars and Saturn form Raja and Dhana yogas (yogas of worldly and financial success). With sign lord (dispositor) of the Ascendant lord in an angular house in its own sign, this creates a Parvata yoga, giving further proof that this individual gains strength, especially during major or minor Saturn or Mars Dashas. However, these yogas are diminished somewhat by the influence of Jupiter in the 10th house, as Jupiter is lord of the 12th house of loss, and as such can bring down a career. But adding to the complexity of this chart there are other contradictory yogas. For one, the Amala yoga occurs when a classic benefic planet is situated in the 10th house from Moon or the Ascendant, which occurs here with Jupiter. The Amala yoga brings a spotless and good reputation. However, the classical benefic planet should not be aspected by classic malefics, and Jupiter is aspected by Mars and Saturn in both the birth chart and the Navamsha chart. We see this contradiction and complexity playing out in the life of Peter Strzok, who appears to have a reputable track record up to Dec. 2017 – when his voluminous anti-Trump text messages to FBI lawyer Lisa Page first became known to the public. Previously, in Aug. 2017 he had been quietly removed from his lead FBI investigator position on the Trump-Russia probe. 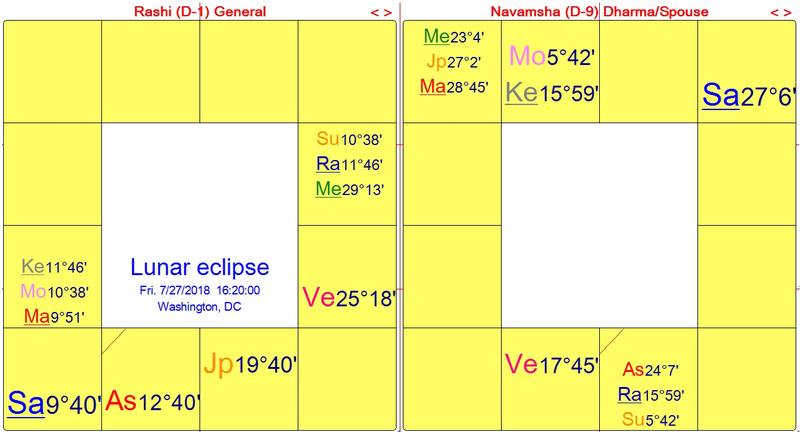 Mars is the strongest planet in Strzok’s birth chart, and when it is in an angular house (Kendra) in its own or exalted sign, as here, it receives special status, called a Mahapurusha Ruchaka yoga. When Mars is strong in a birth chart, it gives physical strength, courage, and the desire to show dominance in combat. Since it is located in the 4th house of the foundation of the mind, it can also disturb peace of mind and create difficulties in the home life and for the marriage or business partner. (Mars aspects Houses 7, 10 and 11 from the Ascendant.) This can be modified by a lot of work and/or activities in the home, shifting the combative nature of Mars to a more effective working/active mode. Since Strzok’s father was in the military, and had a lifelong career in the Army Corps of Engineers and related projects, this also points to the father’s strong influence, especially with Navamsha Sun exalted in Aries in the Ascendant. Mars in a strong angular position prefers to fight the battles of life, and this may account for why Strzok, when faced with the possibility of not continuing in mid-May 2017 on the 2nd phase of the Mueller probe (i.e. the Trump-Russia collusion charge), he chose to do it anyway, saying to FBI lawyer Lisa Page in a text message that he saw it as “unfinished business.” Even though they both agreed “there was no there there” – he saw the Trump-Russia collusion as Part 2 of his work after clearing Clinton in Part 1 of the investigation, and in fact planning her exoneration well in advance, assuming she would become President. In their text message exchanges, both Strzok and Page acknowledge there was no real substance to the Trump-Russia collusion investigation. Page even tried to dissuade Strzok from getting involved in it, as shown in their text message exchanges in mid-May 2017. Strzok began work on both the Clinton and Trump investigations during his Mercury-Mars Dasha (April 8, 2015 to April 4, 2016). Since Navamsha Mercury and Mars are in opposition in Houses 3 and 9, this shows the forceful, potentially combative style of communication that is likely to come forward especially in a Dasha and sub-Dasha when both planets are featured. A person with strong speech (Mercury-Mars) combined with volatile emotions (Moon-Rahu) will probably find it challenging to maintain neutrality, especially when it is required for professional purposes. Now we insert Neptune’s strong influence on the career. Strzok says that his extreme Trump-hatred, as shown throughout 1000s of text messages on government-owned devices, did not affect his ability to direct a fair and impartial investigation of President Trump. Since he says so, we are expected to believe it. But oddly enough, he failed a polygraph test on Jan. 13, 2016 conducted by the FBI. Tr. Moon was in Aquarius conjoining the 4 natal planets in his 2nd house of speech, and tr. Mars was between 11:19 and 11:31 Libra throughout business hours that day. This was Strzok’s 10th house, Digbala (best possible angular house for Mars), and within 1° of the 10th house cusp, closely conjoining natal Jupiter at 12:09 Libra and opposite natal Mars and Saturn. Tr. Mars gave Strzok a lot of physical energy and force that day, but it also contributed to pushing all his buttons, as Mars is already his strongest planet and as sign lord has power over his Ascendant lord Saturn in Aries. Fortunately for him, nothing was done about the failed polygraph test, and nothing would have been done if his text messages were not discovered (and then deleted). He was kept on as Lead investigator of the Mueller probe for two major investigations for another 2 ½ years. Such ongoing protection of Strzok by the FBI and by the Establishment (leftist) media is predictable, but is also shown astrologically by Dasha lord Mercury as the fortunate 9th lord for Capricorn Ascendant. Though this Mercury can be volatile, as it is closely conjoined both Rahu and Moon in the birth chart, it has to give some good results, especially financially, with Jupiter’s aspect to the 2nd house, and with 9th lord situated in the 2nd house: a Dhana yoga of wealth. Most other employees would have been fired under the same circumstances, but Strzok got further help from tr. Saturn in Scorpio (Nov. 2, 2014 to Oct. 26, 2017), which was well positioned in the 11th house from the Capricorn Ascendant, and in the 10th house from Sun, Moon, and Dasha lord Mercury. The 10th house from important vantage points in the chart is Saturn’s best house for career visibility and success. But by late fall 2017 Congress kept asking for the Strzok-Page text messages and the Inspector General was investigating them as well. Strzok’s fortunes shifted downward after tr. Saturn exited sidereal Scorpio and entered Sagittarius Oct. 26, 2017. Only then did his professional and personal issues come under public scrutiny. In April 2015 Strzok was eager to finish up the Clinton investigation, saying to a colleague: “I cannot overstate to you the sense of urgency about wanting to logically and effectively conclude this investigation,” an apparent reference to the Clinton probe. (She had just declared her presidential candidacy that month.) 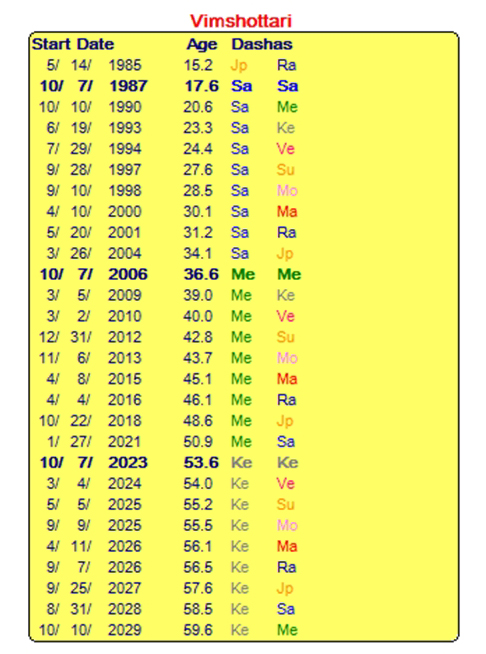 Strzok entered his Mercury-Mars period April 8, 2015 for one year, and as noted previously, the Mercury-Mars opposition in the Navamsha chart is on the 3-9 House axis, with Mercury (speech) in Sagittarius galvanized and heated by Mars in Gemini. With Aries Navamsha Ascendant, these are the classical signs for the 3-9 house axis, and one that can be considered “the nervous system of the world.” Congressional investigators may have noted the urgency the FBI team had for concluding the Clinton investigation, and the contrasting urgency still being played out to keep extending the Trump-Russia investigation, even after 2 years (as of late July 2018) with no results linking Trump to colluding with Russia to affect the Nov. 2016 presidential election. In July 2015 Strzok was promoted to FBI Section Chief, and at the same time he gained status as Senior Executive Service (SES), a position from which one cannot be fired, with automatic income increases regardless of job level accomplishment or competency. As with all the former top Obama officials, Strzok continues to have high security clearance. This used to be revoked from the time a government job terminated – but its continuation is a new policy that raises serious questions about how much power a previous administration should be given to undermine the subsequent administration. At the time of his promotion Strzok was in Mercury-Mars-Jupiter period. Tr. Mercury was passing through 3 signs that month: Taurus, Gemini, and Cancer, while tr. Mars was in Gemini the entire month. It is likely that he received his promotion when tr. Mercury and Mars were both in Gemini: July 5-20, 2015, echoing the Dasha-Bhutki lords. Tr. Jupiter was exalted in Cancer in his 7th house of partnerships, and entered Leo July 14, 2015 through Aug. 12, 2016. Leo is the 7th house from his 4 planets in Aquarius, including the Moon. Thus, Jupiter in Cancer or Leo would be excellent for partnerships, and/or expanding opportunities in partnerships. This was probably the time he was assigned as an FBI agent to work with FBI lawyer Lisa Page, with whom he also had an extramarital affair for several years. On July 6, 2016, FBI Director James Comey announced that Hillary Clinton was cleared of all charges in the FBI investigation into her use of private servers and her handling of classified information during her tenure as Secretary of State. Strzok played a major role in this process, and his text messages indicate he planned well in advance to exonerate Clinton. But tr. Neptune turned Stationary Retrograde June 13, 2016 at 17:58 Aquarius, very close to Strzok’s Moon-Rahu at 18:36 Aquarius. So there was only an illusion of completion. Sept. 26, 2016: Strzok and his team were notified that a new cache of Clinton emails from Anthony Wiener’s laptop – 675,000 of them – were obtained through a search warrant by the N.Y. Police Department in a separate investigation. (Anthony Wiener is the husband of Huma Abedin, long-time assistant to Hillary Clinton.) Strzok’s text on Sept. 28, 2016 says a team would go the next day to review the new trove of emails. Previously, only 30,000 Clinton emails were made available to the FBI. Strzok was in Mercury-Rahu period April 4, 2016 to Oct. 22, 2018. 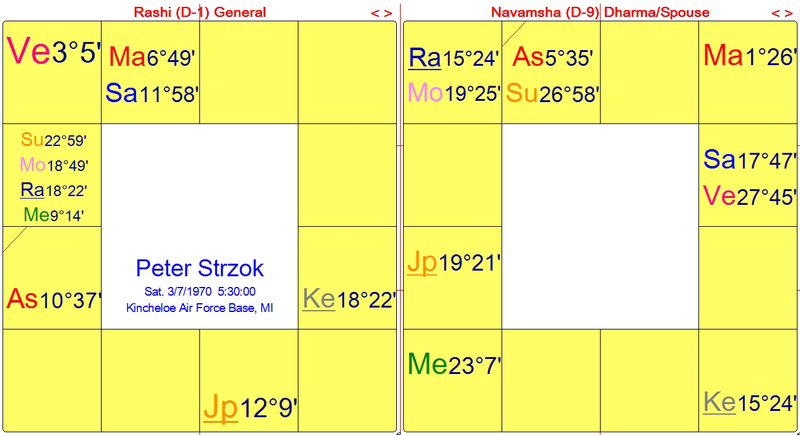 Since Mercury and Rahu are closely conjoined in the birth chart in the 2nd house, we see the possibilities for unpredictable trends for Strzok’s communications and/or his finances. Much of Strzok’s work on the two major FBI investigations was done while Rahu and Ketu were transiting through Leo-Aquarius: Jan. 9, 2016 to Sept. 15, 2017. Since he has 4 natal planets in Aquarius, including Rahu, this transit adds to the potential for turbulence that already underlies this combination. In Sept. 2016 tr. Rahu was travelling within 1° orb to exact of Strzok’s natal Rahu, which in turn is within 27’ of orb to his natal Moon. A Solar eclipse occurred Sept. 1, 2016 at 15:15 Leo, just over 3° opposite his natal Moon-Rahu. This was a very dramatic period pertaining to the Clinton investigation that had been previously closed July 6, 2016, and with the presidential election coming up Nov. 8, 2016. With this new trove of very damaging evidence, someone was needed to stop it from seeing the light of day, as it would surely reopen a criminal investigation of Hillary Clinton and the Clinton Foundation. In that regard Peter Strzok and his wife were perfectly positioned to protect Clinton. FBI Director Comey briefly re-opened Clinton’s email case in late Oct. 2016 and closed it a few days before the election. Peter Strzok and his wife knew too that in legal terms, married couples cannot be forced to testify against each other. Thus, astrologically, we begin to see how Strzok’s Moon assumes such importance as lord of the 7th house of partnerships, both business and marriage. Oct. 14, 2016: Peter Strzok’s wife Melissa Hodgman’s promotion at the SEC occurred three weeks prior to the Nov. 2016 presidential election. As mentioned, Hodgman’s promotion occurred literally within hours of when text messages were exchanged between Strzok and his FBI associates regarding their initial review of 675,000 new Clinton emails on Anthony Wiener’s laptop. Dec. 1, 2017: Strzok’s removal from directing the Trump-Russia investigation was made public, though it happened quietly in Aug. 2017. He was moved to FBI’s Human Resources division, but did not lose his high security clearance. Tr. Saturn entered Sagittarius Oct. 26, 2017, a critical factor astrologically, and a less advantageous position for his Ascendant lord to be transiting to help protect him career-wise. On July 27, 2018 the Total lunar eclipse at 10:38 Capricorn almost exactly conjoined Strzok’s Ascendant (10:37 Capricorn). This has affected his life dramatically, and brought him to public attention for months in advance. Though his name first became known more widely in Dec. 2017, it was not until spring 2018 that more of the public and the media paid attention to Strzok as a lead FBI agent. And not until the Inspector General’s Report was released June 14, 2018 did Strzok’s leadership role in two major investigations (Clinton and Trump) become more fully revealed. The IG Report also confirmed his part in a larger pattern in which the Dept. of Justice, the FBI and numerous intelligence agencies conspired against President Donald Trump from the time he announced his presidential candidacy June 16, 2015. The response to the IG Report and to Strzok has echoed the fiery qualities of the eclipse, with Mars-Ketu closely straddling the eclipsed Moon. Mars in its sign of exaltation for 6 months up to Nov. 6, 2018 accentuates this point. In the eclipse chart, 7 out of 9 planets are in Chara signs: Cancer, Libra, Capricorn. Chara means active, and together with the close Mars contact to the eclipse, it indicates that the public (Moon) is more than usually heated up by events (including hot weather!) in the surrounding period. For a brief review of how to read a South Indian chart, please click here. July 27, 2018: Not only is the latest Total lunar eclipse within 01’ of arc to Strzok’s Ascendant, but tr. Rahu hovers close to this degree area for most of the summer, signaling the possibility of deep upset to him personally, physically, if not also in his most important partnerships, including marriage. Tr. Rahu is within 1° of his Ascendant from July 30 to Sept. 5, 2018 and conjoins his Ascendant exactly on Aug. 17, 2018. Tr. Mars turns Stationary Direct at 4:30 Capricorn on Aug. 27, 2018 and conjoins his Ascendant exactly (also at the Total lunar eclipse degree) Sept. 26-27, 2018. Strzok’s wife Melissa Hodgman (b. Feb. 12, 1968) has natal Moon in the vicinity of 10° Cancer, so it appears there are more fireworks to come for Peter Strzok and possibly his wife as well. Lisa Page testified in Congress behind closed doors (July 13, 2018), and Democrats and Republicans alike were happier with her testimony than with Strzok’s the previous day, as she answered far more of their questions than Strzok did. However, both of them claimed their extreme political bias did not affect their work on either the Clinton or Trump investigation. Strzok will most likely be recalled to Congress to answer questions his FBI lawyers would not let him answer previously, especially regarding the so-called “Russia dossier.” Illegal surveillance was conducted on Trump and his team up through Oct. 2017, and may have started as early as Dec. 2015. An unsubstantiated 30-page report (“the Russia dossier”) was the key document used to persuade the FISA Court to allow such spying. The Clinton campaign and the Democratic National Committee (DNC) paid for this document, but the FBI never informed the FISA Court of this fact, nor that it had never been verified. Meanwhile, Strzok and his team cleared Hillary Clinton in what is widely regarded as a sham investigation, after which he and his team went on to try to prove that Trump colluded with Russia to win the 2016 election. But after 2 years Mueller’s probe has so far failed to find conclusive evidence of any such collusion. The leftist Establishment media meanwhile keeps shifting the narrative, now saying that it is “unpatriotic” to try to shut down the Mueller probe. There is no apparent concern for the fact that the FBI spied on a presidential campaign and used fabricated partisan political research to justify the surveillance. There is also no apparent outrage that this research was paid for by the Clinton campaign and the DNC. Obama’s DNI James Clapper even said “it was a good thing” they spied on Trump – to protect him from the Russians. He said they used “a paid informant,” not a spy. So that was okay. Mainstream media swallowed and delivered this information as real news – another reason they continue to lose large segments of their audience. To recap, Strzok had some career protection as long as tr. Saturn was in Libra or Scorpio, a 6-year period spanning from Nov. 16, 2011 to Oct. 26, 2017, when Saturn exited Scorpio and entered Sagittarius. This transition, along with tr. Jupiter in Libra (Sept. 17, 2017 to Oct. 12, 2018) was definitive, even if he was still in the Dasha of his favored 9th lord Mercury. During most of 2018 Strzok’s Sun at 22:59 Aquarius is close to transiting Neptune. On June 18, 2018, tr. Neptune turned Stationary Retrograde at 22:23 Aquarius. On June 27, 2018 he appeared at a closed door hearing in front of the House Judicial Committee, with tr. Neptune at 22:22 Aquarius within 1° of the SR degree. Tr. Moon and Saturn were in Sagittarius in his 12th house opposite tr. Sun, not an ideal placement for the Moon, but in perfect consonance with his desire for secrecy. However, the topic of his voluminous text messages on sensitive FBI matters is now an open secret, and not reflecting well on Page, Strzok or the FBI. Strzok’s televised Congressional hearing July 12, 2018 was on the exact day of a Solar eclipse, and thus already an extremely intense period and guaranteed to be emotional and heated. The eclipse occurred at 10:48 pm EDT on July 12, 2018, so the whole day of hearings were leading into the eclipse. Tr. Neptune was also at 22:14 Aquarius, still within 45’ orb of conjoining his natal Sun. Sun-Neptune can affect one’s ability to see clearly what is happening, and in the process, one can easily obfuscate whatever possible in order to protect oneself from full exposure. Two days earlier, on July 10, 2018, tr. Jupiter turned Stationary Direct at 19:14 Libra, which in this case is not that good for Strzok, as Jupiter is 12th house lord and tends to produce both loss and excess, even though it also accurately describes working with clandestine matters. On July 12, 2018 there was again a Sun-Moon-Saturn configuration, only this time Sun and Moon in Gemini were opposite Saturn in Sagittarius. Sun and Moon were approaching an exact Solar eclipse July 12, 2018 at 26:34 Gemini, and tr. Saturn at 10:39 Sagittarius is within 02’ orb of Strzok’s exact 12th house. The 8th and 12th house cusps (especially the 8th) connote the possibility of loss or even death. If this is the death of his career, it is hard to say yet, as Strzok is so protected by the FBI (and possibly the CIA). Sun-Moon-Saturn is also indicative of marriage endings or separations. So far there has been no word of Page or Strzok breaking up their respective marriages, but Sun-Moon-Saturn is a riveting symbol of a 2 ½ year waterfall of messages within an extramarital relationship, and one that provides some key evidence of the mode of operations going on at the highest levels of U.S. law enforcement. Strzok met with the U.S. Congressional House Intelligence Committee behind closed doors on June 27, 2018 and had his first televised Congressional hearing July 12, 2018. Both hearings went on for over 10 hours and are the subject of ongoing heated debate. Democrats cheer on Strzok, minimizing his extreme anti-Trump bias at every turn, while Republicans see his actions as seriously complicit in protecting one presidential candidate while trying to destroy the opposition candidate, who subsequently became President-elect, then President. It was Peter Strzok who changed the Clinton report about her handling of classified emails and use of a private server from “grossly negligent” to “extremely careless.” The shift in language changed the outcome for Clinton in stark terms from a prison sentence to a slap on the wrist. Such is the powerful role Strzok played in the FBI investigations. The FBI and others want us to forget what a powerful a role he played, but the Total lunar eclipse exactly on his Ascendant in late July 2018 is unlikely to let us forget. It will only make us want to know more about what he did and what he knows. It has all the earmarks of treason and sedition, but we are urged to minimize his role, along with his extreme political bias against the man he was investigating. Copyright ©2018 by Edith Hathaway. All rights reserved.